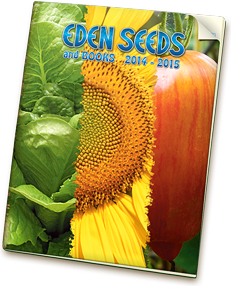 Although the Eden Seeds & Select Organic website have all of the same information as it's paper counterpart, and in many cases contains more recent details, you may wish to receive a hardcopy version of the catalogue for easy reference. Just fill out your details below, and a 96 page colour catalogue will be on its way to you shortly! Please allow at least one week for delivery as we only send out catalogues once per week in bulk quantities due to postage costs. Please make your request once only, as making multiple requests will not get you your catalogue any sooner. In the meantime you can browse the full list of available seeds online throughout our website. Due to mailing costs, we do not send our mail order catalogue overseas.